Shield Technologies™ supply award winning solutions that reduce the costs and inefficiencies in the welding and cutting process, whilst at the same time improving the quality. The company’s ethos has resulted in a range of locally designed and manufactured products that not only offer operational value and guaranteed savings but are also environmentally friendly. 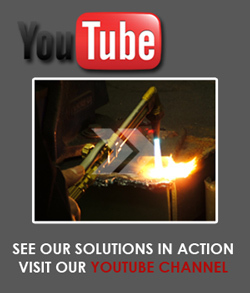 The Shield Technologies™ product range is aimed at the welding and industrial sectors. It includes surface protection products that reduce weld spatter, and gas optimisation and measurement solutions that encompass gas leak detection and gas flow management. Established in 2001, the company has a proven track with customers such as Actom Group, Kwikot, Powertech, Tenneco Ride Control, and The Ford Motor Company of Southern Africa. Winner of the Afrox 2002 SASSDA Welding Category accolade, awarded for innovation in the field of globally competitive welding solutions, and more recently the Industrial Innovator of the Year Award at the Eskom ETA Awards, and South African Association of Energy Efficiency Energy Award of Excellence, Shield Technologies™ strives to continually bring innovative and efficient welding solutions to market. Shield Technologies™ is a privately owned company, headed up by Wayne Holt. Wayne holds M.Sc. Eng (Met) Welding Engineering and MBA degrees from the University of the Witwatersrand. He has over 20 years of experience in the engineering field, of which fifteen nearly twenty have been focused in the welding and cutting environment.